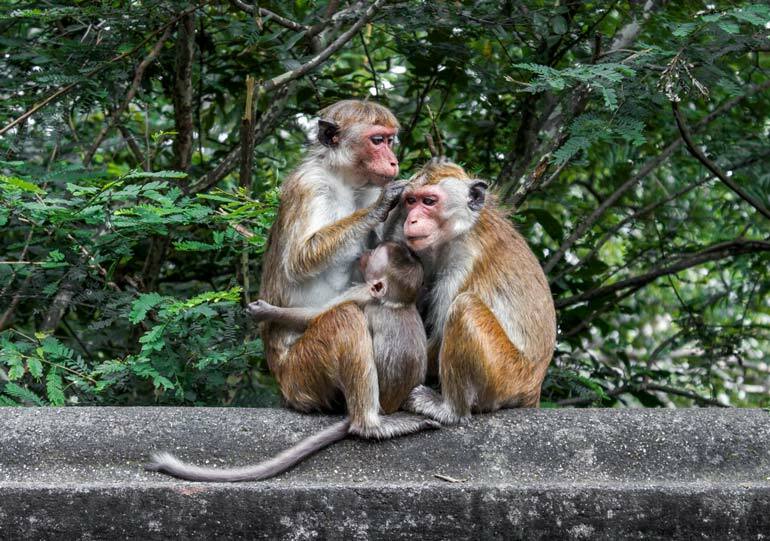 Sri Lanka is becoming more and more popular as a destination for family travellers . In Sri Lanka you don’t have to choose between adventure and relaxation. It is easy to combine a Sri Lanka safari holiday with a relaxing kid friendly beach vacation and create an unforgettable adventure the whole family will love. With so many beaches and safari parks to choose from I asked a group of experienced travel bloggers to let us know their favourite places in Sri Lanka. 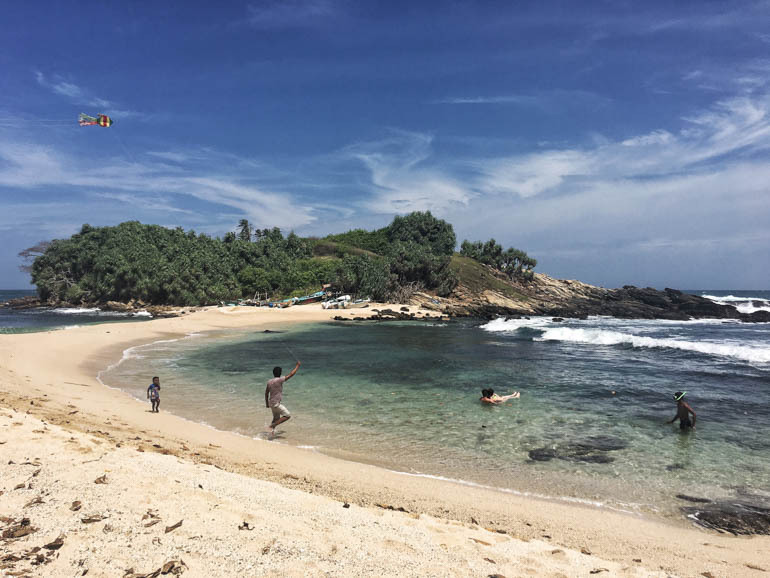 You can mix and match beach and national park to create your own kid friendly Sri Lanka Itinerary. With two distinct monsoon seasons the best time to visit the West and South-West of Sri Lanka is November to April and the East and North-East is April to September. 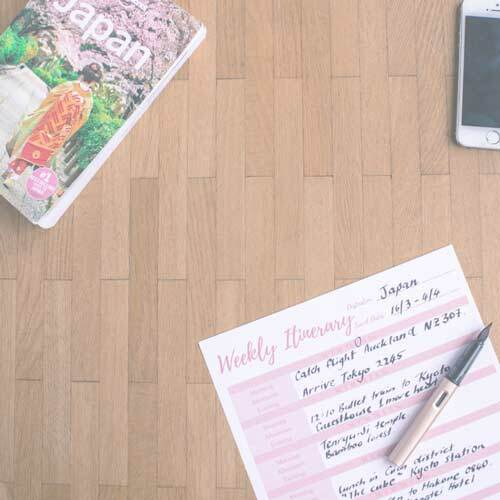 This makes Sri Lanka a year round destination, at the bottom of each destination in the post you will find a recommendation on the best time to visit. A note on Dengue Fever: Dengue is a life threatening mosquito born illness and is endemic in Sri Lanka. Outbreaks peak after heavy rainfall. Please consider Dengue risk when planning your trip to Sri Lanka and speak to a travel doctor about how to minimise your risk. You can find more information on the CDC website. If we are to recommend a friendly safari and beach in Sri Lanka, our answer would be Arugam Bay. It’s a well-known surfing spot but this fisherman town offers so much more than its waves. Our favorite thing to do in Sri Lanka was exploring Kumana National Park and its 200-hectare bird reserve through the Tuk Tuk Safari. Yes, you can take in many of Sri Lanka’s wonderful sights by riding a tuk tuk. Once in Kumana National Park, you will see plenty of elephants alongside the road, as well as crocodiles, deer, buffalo and even peacocks. We saw an elephant for the first time in this park and we were even able to observe the creature for a few minutes. The guide knew exactly what to do during such encounters and both the elephant and our group went on peacefully. It was a really wonderful experience!. Apart from the safari experience, we also enjoyed spending the day in different beaches. All the beaches in Sri Lanka that we were able to visit were very tranquil and inviting. We were able to relax for such a long time since we went to the beach first thing in the morning and waited for the beautiful sunset before heading back to our room. The safari tour was expertly organized by Lazy Arugam Bay where we were staying for our trip. The place is the ideal accommodation when traveling with children. The staff is very detail-oriented and took care of all our needs. Lazy Arugam Bay is located in a quiet area and offers all the comfort you could expect from a hotel. The entire staff was friendly and warm, and the breakfast they served was awesome! Prices are very affordable and the hotel is conveniently located, only a few steps away from the beach and the main street in Arugam Bay. The bus station is also quite near: just take a 5-minute ride on the tuk tuk and you’re there! Going on a safari in the Udawalawe National Park was one of the highlights of our family trip to Sri Lanka. The national park is well known for its abundance of elephants, with herds of these majestic creatures seemingly around every corner. There are also many other animals and birds, including deer, buffalo, monkeys, and eagles perched high in the trees. The entire experience was super family friendly, and the process for organizing and going on the safari is straight forward. Our day started when we met our jeep driver out the front of our homestay before first light. He drove us to the entrance of the park, paid the fees for us, then as soon as the sun began to rise, we were inside the national park and looking for animals. It wasn’t long before a large herd of elephants came into view. I can still remember the shrieks of excitement from our 6 year-old. Elephants are great family viewing animals as they are large, slow to move around, and generally indifferent to being watched. And in the female herds, there’s often very cute baby elephants as well. There are sufficient animals to spot in the park which keeps the interest levels up. The roads are good to drive on, with only a few bumpy areas, and the drivers are very conscious of animal welfare and made sure they didn’t get too close to the animals. There are two lengths of safari generally available and we took the shorter one, meaning we had a great time seeing many animals, without the burden of the trip being too long. Once the safari had finished, we went straight back homestay where a delicious breakfast was waiting for us. An unforgettable safari experience for the whole family. Price of safari: The total cost for the 3 of us (2 adults, 1 child) including jeep, driver, entrance fees, and tip was a very reasonable USD75. We arranged the safari through our accommodation. Where we stayed: Adambari Safari Villa. The accommodation is comfortable, the host family very friendly and helpful, and the food amazing. As with other homestays in Sri Lanka, this was a family friendly environment, with children always the centre of attention. As we only stayed in Udawalawe for the safari, we ate exclusively at the homestay. The food was excellent. The best time to visit to view migratory birds is during the wet season between November to March. Between May and September the dry season draws the larger animals out to the remaining watering holes, but the chance of seeing elephants is high year round. Mirissa Beach on the southern coast of Sri Lanka is a great beach destination for everyone. The beach is long and wide and therefore perfect for relaxing and sunbathing during your Sri Lanka travels. 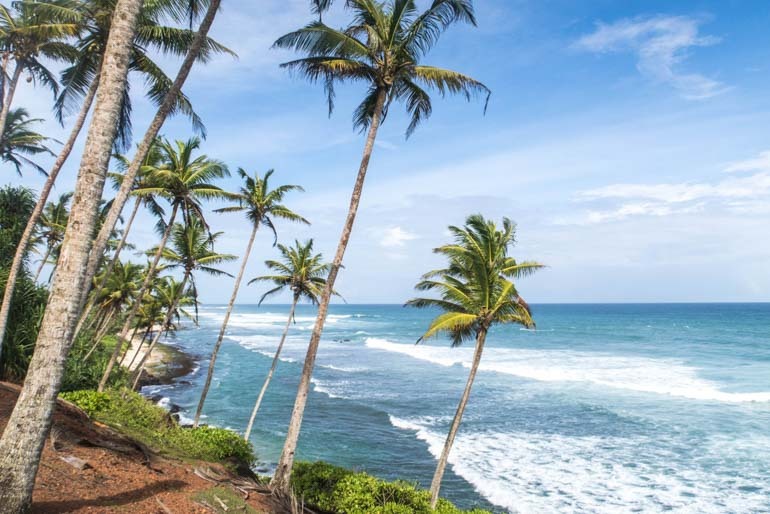 While there are several guesthouses and hotels around Mirissa, you can also easily reach the beach from nearby Welingama or even from Galle as a day trip, since the coastline is conveniently connected by public busses. In case you would like to see a little bit more of the area, head a little bit east of Mirissa beach for the famous palm hill, a beautiful picture spot right at the coast. There’s also the famous Parrot rock on the eastern tip on Mirissa beach and a short climb (be careful, especially with younger kids) leads you on the rock for a wonderful view of the beach, in particular for sunset. There are several beach restaurants in the sand where you can have a snack during the day or dinner after sunset. These restaurants have a variety of fresh fish and it’s nice to sit so close to the ocean. 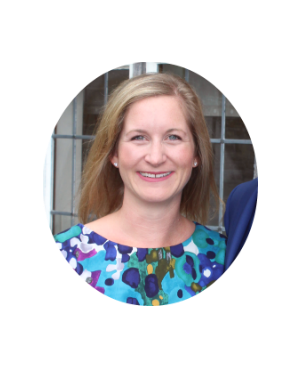 I also enjoyed the atmosphere at the beach – it wasn’t very crowded, it seemed to be a safe atmosphere and the locals were all very friendly. Therefore, I’d recommend this beach for your next family holiday. The best weather is between November and April with whale watching season between December and March. My favorite safari in Sri Lanka was Bundala National Park. 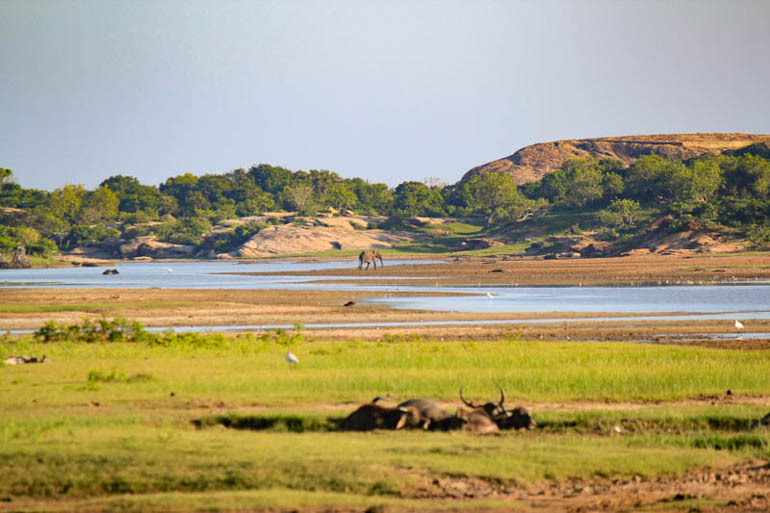 Located in the south of Sri Lanka, and not far from the much more famous Yala National Park, Bundala is a hidden gem. Bundala is small park that’s especially fun for people who enjoy seeing myriad birds and a wide variety of animals. Most people take a half day safari, either in the early morning or the late afternoon. We chose to visit in the afternoon. We saw a number of larger animals, including elephants, deer, buffalo, wild boar, monkey, mongoose, rabbit, monitor lizard, and crocodile. Sadly, we did not spot a leopard, but I have read that it’s possible to occasionally see these elusive animals. 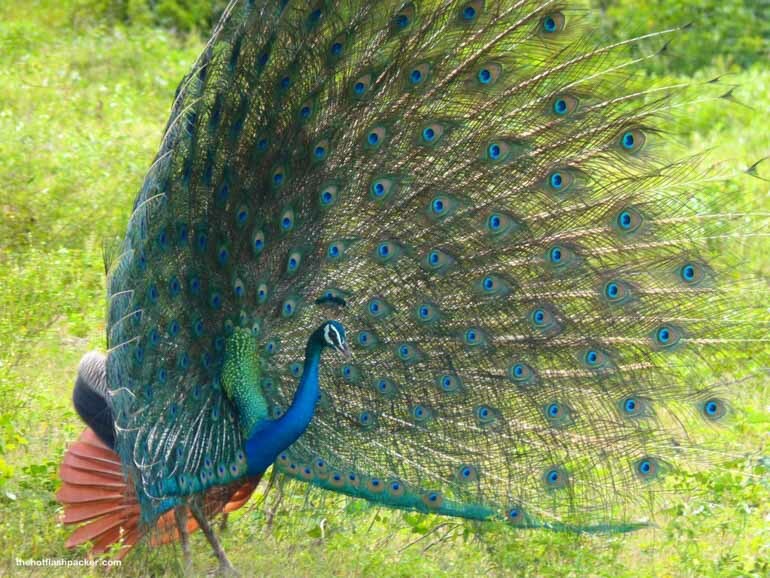 If you love peacocks, this is a great place to see them. We saw many males displaying their feathers and as the sun set they started to roost in the trees. Other birds include hawks and water birds. You tour will likely include a stop at a beach where we spied sea turtles swimming and peaceful fishing boats laid on the sand. What is the best time to visit Bundala National Park? Between May and September is the dry season and visiting migratory birds inhabit the wetlands between September and March. Nilwella is one of the nicest places to visit in Sri Lanka, home to a bunch of beautiful, easily accessible beaches. The nicest one is Blue Beach Island, for it is a pristine, tiny cove with shallow clear waters. From the beach it is possible to get onto the island, from where there’s beautiful sunrise views. The area is not very touristy (most tourists stay in the nearby Blue Beach, just a km away or so), which means it is incredibly peaceful and great value for money. Nilwella is located between Tangalle, a more popular (yet not nearly as charming) beach destination, and Dikwella, which on the other hand has little to offer to tourists aside from a beautiful local market that sells a lot of fresh produce. Nilwella is a lovely fishing community, so there’s a lovely small harbor where the colorful boats return to after a day of fishing. One of the recommended places to stay in the area is Vattersgarden Isolabella, a property that allows direct access to Blue Beach Island and that has spacious, comfortable rooms all facing a well kept garden, and a great swimming pool. It’s a place to get ayurvedic treatments, so the food is incredibly healthy and tasty, cooked using local ingredients only. The best way to get to Nilwella is to catch a bus headed to Matara and following to Mirissa or Galle. Alternatively, it is possible to take a bus to Tangalle and from there one that goes to Dikwella: just ask the driver to drop you off at the junction to Nilwella and take a tuc tuc from there. 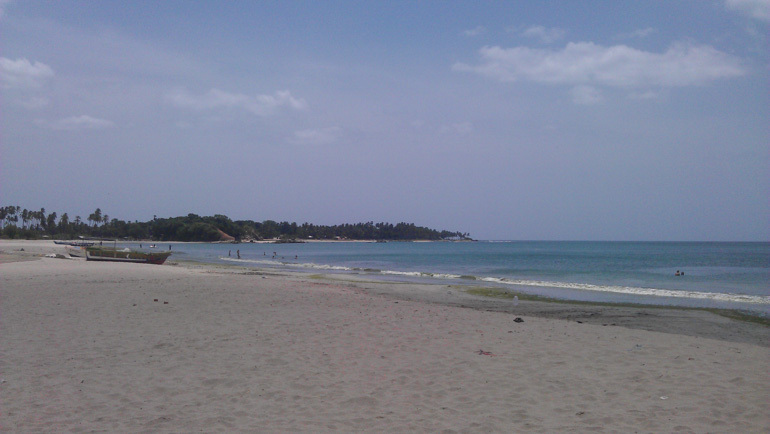 The best time to visit Nilwella Beach is November to April. restaurants and a plethora of activities that are perfect for all ages and you have a winning family beach! It’s perfect for your Sri Lanka itinerary. To begin with you’ll be struck by the beauty. It’s simply the quintessential paradise beach: white sands, turquoise waters, palm trees…Nilaveli has it all. There’s plenty of space as well, meaning there’s a sense of peace and quiet that you don’t find in many other paradises! For family activities consider all the usual beachfront shenanigans, but for something more adventurous why not take a boat out to the fantastically named Pigeon Island. Here you can paddle in the shallows or hire a snorkel to swim with the huge variety of marine life that congregates at the reef there. Or, why not go on a whale and dolphin tour? Catch the sunrise at sea, while scanning the horizon for more magnificent marine wildlife. Food lovers will be happy too. There are a wide variety of restaurants to choose from at Nilaveli beach, but I can definitely recommend ‘The Crab’. It’s a fantastic restaurant that serves amazing food right on the beach. Sit eating fresh seafood, listening to the surf crashing a few metres from your feet.Whatever you do though and wherever you eat, you’ll be sure to find something to keep you and your family happily entertained here. Covering a huge area of over 1200 square metres, Yala National Park is in the south east of Sri Lanka. The park is home to elephants, crocodiles, buffaloes and monkeys who graze on the grassy plain and scrubland and drink at the lagoon. But most people visit Yala to see its community of leopards. At Yala there is some highest density of leopards in the world with just one block of the park home to 25 of the beautiful creatures. where to find the animals and how to approach them in the most appropriate way. We toured Yala with Kulu Safaris who aim to be the ecologically conscious safari operator in Sri Lanka. The guides’ respect for their environment and the animals in the park was evident during our tours of the park and in their safari camp. Touring Yala with these passionate guides is a great way for children to get close to and respect nature. The team at Yala were friendly and thoughtful towards all the children on the tour. Our memories of Yala are of wandering elephants, sleeping leopards and campfire chats back at camp. The safari was a highlight of our trip to Sri Lanka. The best time to visit Yala National park is from February to June, check for park closures in September for maintenance. 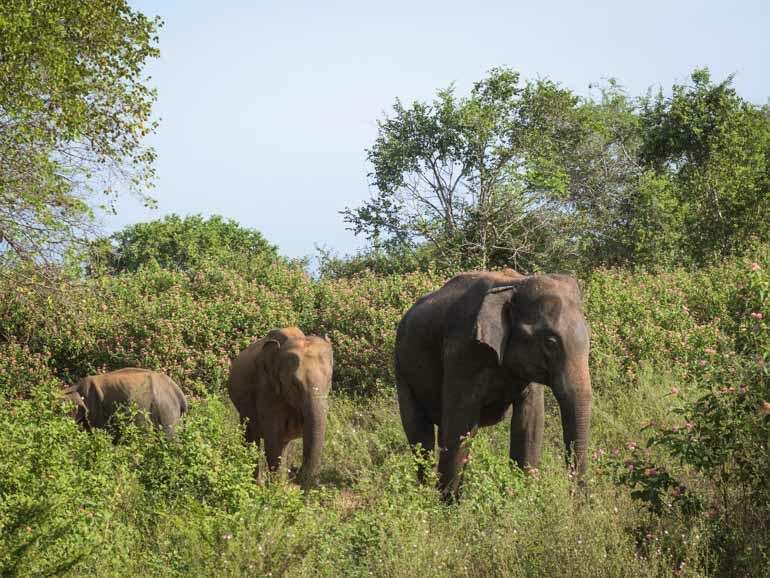 If you are looking to spot elephants in the wild in Sri Lanka, you cant go wrong with Kaudulla national park. This was one of the highlights of our Sri Lanka itinerary. We were based in Sigiriya to explore the Cultural Triangle of Sri Lanka, and Kaudulla national park made for a great break from cultural sightseeing. Our wildlife tour included pick-up and drop from or hotel in Sigriya which made exploring this national park easy with our 3-year old daughter. The national park is about an hour’s drive from Sigiriya. 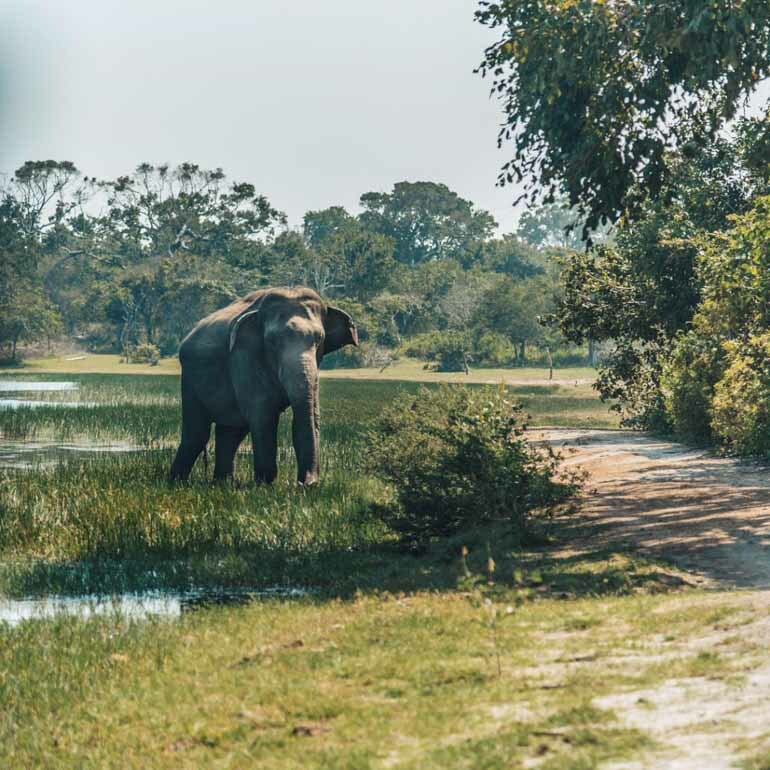 Kaudulla national park provides for an 6000 plus hectare corridor for elephants and is more grasslands than thick forests, perfect to see herds of elephants in their natural habitat. Kaudulla national park has a lovely lake within, and we spotted some beautiful birds including storks and peacocks next to its shore. It gets less tourists than its big brother in the area, Minneriya national park. We spotted only 2 other jeeps during our afternoon safari and the less crowd is perfect to follow the elephants for more than an hour. Kaudulla national park is open year round and can be visited on a jeep safari from Habarana, Polonnaruwa, Sigiriya or Dambulla. Dry season is April to October at Kaudulla with elephants seen year round in the Park peaking between August and December. 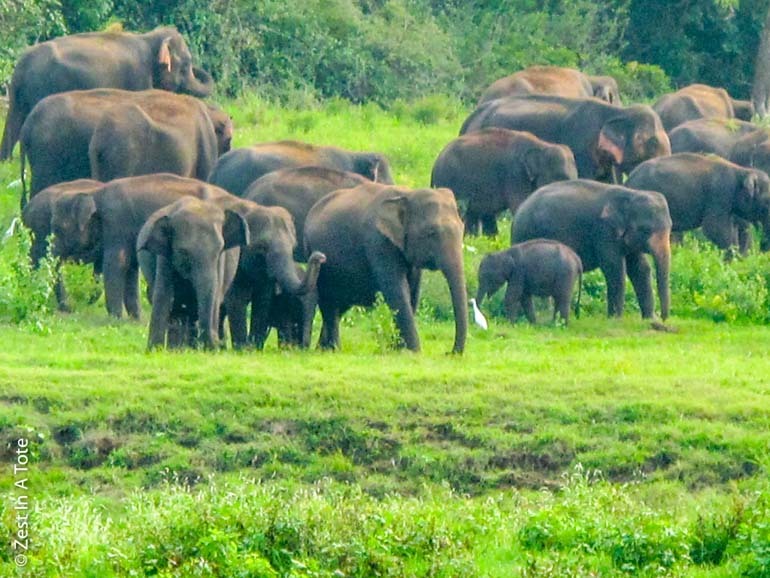 Are you planning a wildlife safari in Sri Lanka? What about a family beach holiday? Let me know in the comments where you have decided to go! 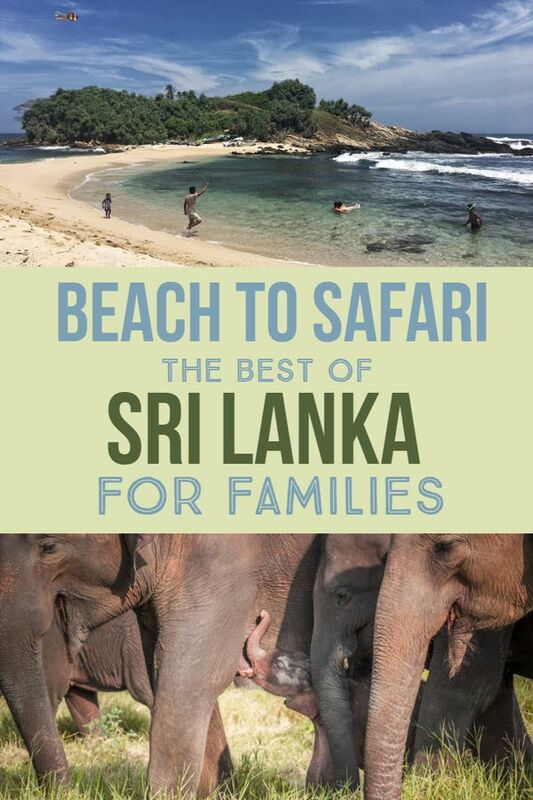 If you’ve already visited Sri Lanka what were yours favourite beaches and safaris? Were you with kids? What was it that made it so special? Please let me know in the comments or on my Sri Lanka post on facebook. Interested in staying in a luxury safari camp with kids in Sri Lanka then check out my post on glamping in Wilpattu National Park. Should I take my toddler to Morocco? Start planning your trip to Transylvania, more than just tales of Dracula.